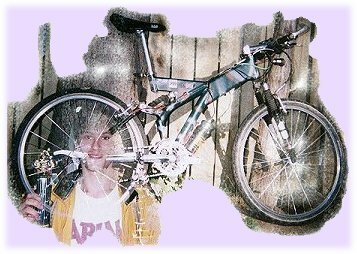 Welcome to Steve's Mountain Bikes,we hope to include many pictures and useful links for you to use. 18k race - time : 56 min. 40 sec. Final score = 82 points. I ride on the Thames Valley Trails in London, Ontario, Canada. This Mountain Bike was drawn by Steve. Click on button to see full size picture. These pages will change throughout the season, with pictures and informations on the Boler Mountain Trails, working out and races. We have a message board at the bottom of this page. Steve and I have worked very hard on creating the graphics that are included within this site, and we ask that SHOULD you copy any of these graphics, that you copy them to your own disc or hard drive, and NOT LINK DIRECTLY to these pages. We APPRECIATE a LINK FROM not TO these pages, if you do use them. Thanks for visiting us, and please come back often for updates.